An art exhibition including ‘Art on the Allotment’ opens at the Dean Clough Art Gallery in Halifax this weekend. 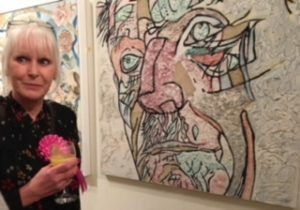 Carole Thornton pictured above with her portrait of an old man, one of a series of three pictures, for the exhibition at Dean Clough Art Gallery in Halifax. 19th of January to February 3rd 2019. In the main Crossley Gallery. The picture above is a recent self portrait of Carole. 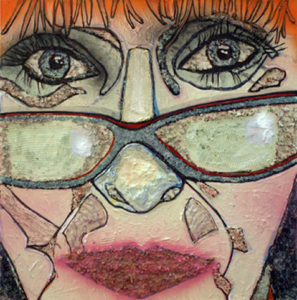 The delicate colour of the spectacle frames comes from the dried lavender flowers and the orange hair is made of string. A detailed look at this amazing picture ends up being a tour of Carole’s allotment! Carole Thornton’s artist palette contains allotment Soil, Sunflower heads, Rose petals , Lavender both flowers and stalks , Larkspur , Teasel heads, Cornflowers , Delphiniums, Marigold , Rosemary leaves and seeds heads, roots and stalks. In fact she includes anything that dries well enough to be-to included in her art work, all sourced and grown on her allotment, in the West Riding of Yorkshire. The exhibition entitled “Uncertainty + Diversity = PAINTING TODAY” contains a sample of works by the Artists of Redbrick Mill who, under the guidance of Tom Wood, have been invited to create a work of their own choosing on a metre square surface. No limits were put on subject or materials. The work might be a summation of previous works or the springboard for further work, either way it marks a significant point in each artist’s progress and as such this exhibition is a record of that moment. This exhibition of work uses a wide range of media and at the heart of it is a challenge. The challenge is to confront a chosen subject on a metre square surface and to invest that subject with authenticity and passion. To engage with the diversity of expression evident today replete with all its uncertainties, cynicism and doubt and in that challenge find a form of truth. Discover a veracity of meaning that is both aware and brave, not a timid, apologetic form but a kind of painting that is direct even bold. It is a form of painting not born of ignorance but of confidence, of hope, painting as a necessary tool, a heavy anchor when the centre creaks. These paintings are a yell of hope, a cry of celebration but most importantly they are an adroit coaxing of a dumb material into loud proud eloquence, uncertainty plus diversity is most certainly Painting Today.